You remember two weeks ago when the Phillies returned from the All-Star break and there was actual, real talk around Citizens Bank Park about the club’s chances to compete for a wild card? You don’t? It was pretty funny. Yes, the Phillies played some spirited baseball in the two weeks preceding baseball’s midsummer break. They had won 10 of their last 13 games and their offense actually looked like it wasn’t terrible for a sustained stretch for the first time in the season’s first three months. But you know what they say about small sample sizes, right? Or you at least remember the most famous words ever spoken by let NFL coach Dennis Green, correct? Following a night when they hit a trio of homers at Turner Field en route to victory, the Phils bats went back into hibernation in a 2-1 defeat to the Atlanta Braves on Friday night. 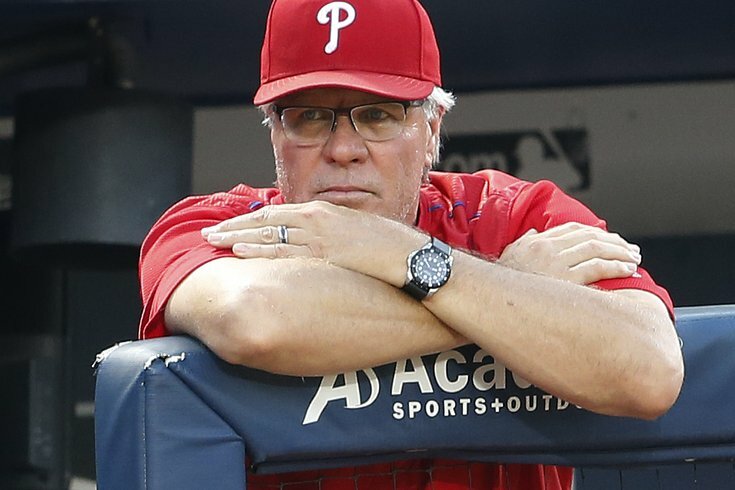 The Phillies (47-58) have lost 10 of the 15 games they’ve played since returned from the All-Star break. They have scored four runs or fewer in 14 of those 15 games (Thursday night’s home run parade being the lone exception). Vince Velasquez was the recipient of the latest lame effort from Pete Mackanin’s bats. The 24-year-old scuffled some and looked more like the pitcher who struggled to keep his pitch count low in the season’s first 2 1/2 months and less like the guy who began to find his groove in July. But Velasquez’s pure stuff was still good enough to limit Atlanta to two runs - on hits from Nick Markakis and Gordon Beckham in the third inning – in six innings to deliver a quality start and give his team a chance to win. Instead a one-run deficit was insurmountable for a Phillies offense that entered Friday with a .216/.278/.330 slash line in its first 14 games since returning from the break. The Phillies had a whopping five hits on Friday. For the sake of Mackanin and Phillies fans everywhere, the offense could look a lot different a year from now, when the likes of J.P. Crawford, Nick Williams, and Jorge Alfaro could all be entrenched in the daily lineup. And perhaps the Phillies will use their sudden surplus of pitching to acquire more offense? Following Friday's game, CSNPhilly's Jim Salisbury reported the Phillies and Texas Rangers were deep in trade discussions involving, you guessed it, the most productive Phillies player from Friday's game: Vince Velasquez. Texas, which is also among the teams to have interest in Jeremy Hellickson (who is scheduled to start Saturday against the Braves), has a dearth of starting pitching behind Cole Hamels (who they acquired from the Phillies a year ago tonight) and has an attractive array of young bats both in the big leagues and upper levels of their farm system, too. With or without that kind of franchise-shaping trade, the Phillies could bring some of their own young bats into the big leagues on or before Sept. 1, when rosters expand. Until then, Phillies fans will have to watch the offense as its currently constructed.